Designed for use where air-sampling duct detectors cannot be used, HS-100 installs in surface- or pendant-mount configurations in air shafts, plenum spaces, and other low or no air velocity areas (100 fpm). All-in-one, low-profile design eliminates need for separate base or test unit and operates from range of voltage input options, including 230 Vac, 120 Vac, and 24 Vac/Vdc. Temperature coverage range spans 32 to 140Â°F for photoelectric model and 32 to 158Â°F for ionization model. 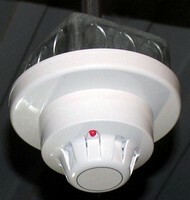 All- in-one detector offers exclusive features for duct smoke detection applications. Pontiac, Michigan (December 21, 2006)-Finding the right duct smoke detector can be problematic in applications where air-sampling style duct detectors can't be used. Air Products and Controls' (APC) new HS-100 duct smoke detector has been specifically designed to protect these areas with installation options and features unavailable in existing products. The detector unit mounts in air shafts, plenum spaces and other low air velocity areas, and offers the greatest range of voltage input options and is available off-the-shelf in both ionization (HS-100-N) or photoelectric models (HS-100-P). The HS-100 Series duct smoke detector installs in surface or pendant mount configurations suitable for a variety of low or no air velocity conditions (= 100 feet per min/30.48 meters per minute). A progressive all-in-one design eliminates the need to purchase and assemble a separate base or test unit. The low-profile unit mounts to a standard 4" square back box or can be installed using off-the-shelf mounting components. As the industry's only low- or no-flow duct smoke detector available in both photoelectric and ionization versions, the HS-100 can be precisely matched to the type of sensing best suited for a given application. The industry-leading temperature coverage range spans from 32° to 140°F for the photoelectric model and 32° to 158°F for the ionization model. In addition to its powerful detection capabilities, the UL-listed HS-100 requires very low current draw for a universal fit with existing equipment. It is the only special application-suited duct smoke detector offering the full complement of input voltages including 230VAC, 120VAC and 24VAC/DC. Several features are unique to the HS-100: in-place wiring capability, extended high temperature ratings, and connection features. Up to 30 units can be directly interconnected to each other and/or to APC's MS- and MSR-Series Remote Accessories. The HS-100 can also be integrated with APC's conventional external mount detectors to form a complete detection system. In the event of smoke detection, entire HVAC systems can be triggered to shut down, preventing the spread of fire and smoke through an air handling system's fans and blowers. An on-board LED display clearly indicates alarm and standby functions at a glance. Installation, troubleshooting, and maintenance are simplified with a built-in magnet test facility and labeled, front-accessible wiring terminals. Air Products and Controls Inc., a Halma Group Company, is a leading manufacturer of duct smoke detectors and accessories, power supplies and packaged control relays. The company is based in Pontiac, Michigan and sells its products internationally. These innovative top-quality products are found in HVAC, life safety, building automation, system integration, security and lighting applications.